High-quality decorative stair treads are must-haves in homes as they last years and help prevent injuries. Decorative stair treads, contrary to popular belief, aren't just for home beautification as they also provide grip as you walk up and down your staircase. Bare wooden steps, although they look incredible, are slippery, which makes them a hazard especially for your kids and pets. Also, outdoor staircases can become treacherous when they're covered in snow, ice, or rainwater. 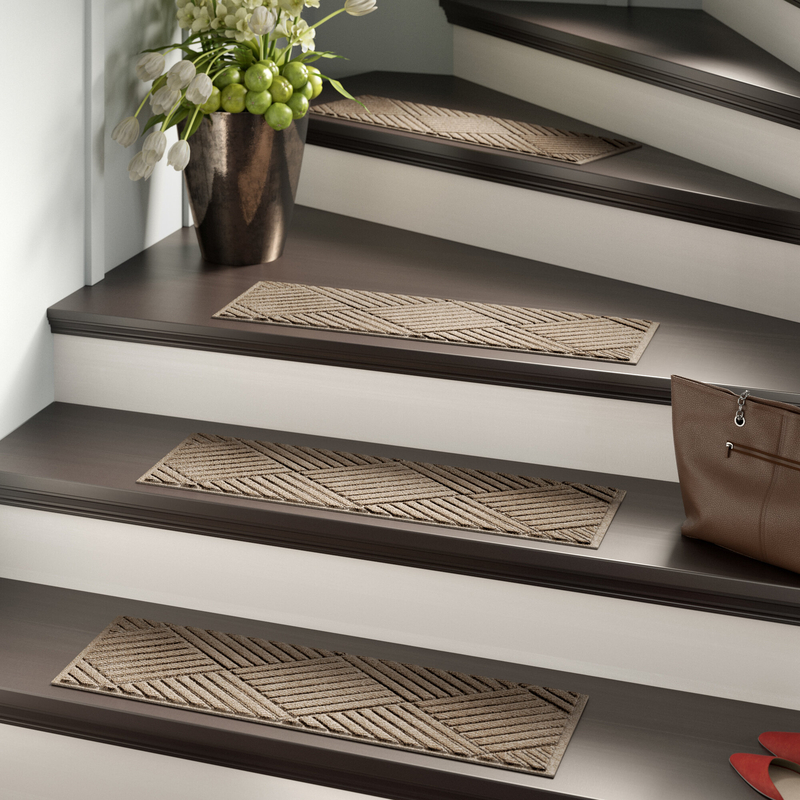 Fortunately, decorative stair treads will make your steps safer. To help you make a selection, consider the points that we've listed below. When determining which stair treads are best to add into your home, you first need to consider the number of mats you need. Of course, you'd want each step to have a tread. If you have 10-12 steps in your staircase, then you need 10-12 mats. A lot of manufacturers and designers would allow you to purchase additional treads if your chosen set doesn't have enough. There are also treads that you can purchase individually. Most stair treads aren't made to wrap the lips of steps. As they only need to sit on top of a surface, your tread's length should be 3-5 inches shorter than the length of each step. Most treads measure 8-10 inches long. Any longer than that should be used on a larger staircase. To determine the maximum length for your stair tread, measure the front of a step all the way to the back. As for the width, you will find that decorative stair treads come in various widths. A tread's width will determine the amount of surface that will be covered in each step. You can go for a narrow stair tread, which is usually 22.5 inches wide. For a wider tread, the biggest you can go for is 36 inches. A wide stair tread is often used outdoors while a narrower design is best used indoors. After you've got the aforementioned aspects covered, you can proceed to the fun part which is shopping! Check out our top picks below as we are sure you'll find a set that you'll love for your home. First up on our list is the Amald Diamond Stair Tread by Red Barrel Studio. This set of 4 should be seriously considered, especially if you want the stair treads that can be used both indoors and outdoors. A great feature of these decorative stair treads is the non-slip backing, making them incredibly safe even when they're wet. The superbly designed, durable products resist staining as well. Another set from the reputable Red Barrel Studio, it offers Japanese-inspired decorative stair treads made out of 100% sisal. Its long-lasting vivid colors can bring an exotic feel to your interiors to remind you of the beauty of Asia. The set includes 13 beautiful stair treads and they're perfect even when you have pets as they're durable and easy to clean. Add just the right amount of color to your stairs using this set of Seal Harbor Light Blue Stair Treads by Breakwater Bay. As the manufacturer aimed to offer superb quality, this set's materials are durable, soft, and long-lasting. The cleaning of the 13 treads only requires the use of common household cleaners. Made of 100% natural Jute, the stair tread from August Grove's Juliana collection inspires a rustic flair to your interiors. This indoor tread's pattern speaks volumes in terms of style and decor. Since it is a highly absorbent tread, it is guaranteed to combat moisture and humidity. This 100% Jute stair tread is an Indian hand-woven runner rug that's popular for its earthy tones and design. Since a staircase is prone to wear compared to any other indoor surface, it's imperative for a homeowner to protect a staircase. This is an excellent choice for it is machine washable, durable, and made of 100% natural materials. Measuring 30 x 8.5 inches, this set of highly decorative stair treads is the perfect choice with its anti-static, 100% synthetic face that resists rotting and mold development. Each tread is certificated to be slip-resistant by the country's floor safety institute. To clean, just hose down. This set has the same pattern and quality materials as the previous stair tread set but the two differ in color. Its vivid color is resistant to fading even if the material is exposed to direct sunlight for years. Yes, it certainly is worth your money! In terms of design, it will bring classic grace to your space. Bring the sophistication and elegance of Persian rugs into your space using this set of authentic Turkey-made stair treads. With its non-slip rubber backing and fade-resistant nylon material, it is guaranteed to offer the best protection for your staircase. It's decorated with exquisite patterns on the surface, making the set a perfect fit for a traditionally styled living space. These commercial-grade stair treads are perfect if you are a dog lover. The rubber material which the manufacturer calls as its exclusive "Water Dam," ensures that the mats keep water and dirt off your delicate flooring and on the stair treads instead. The non-skid rubber backing used for this set is environment-friendly, which tells you that the product is carefully designed and produced. Inspired by antique ornamental iron gates, these decorative stair treads will add intricacy and beauty to your outdoor space with its scroll design. No adhesives are required for these rubber treads - just plop all of them down. Yes, you can finally say goodbye to dangerous, slippery surfaces! Because of how stiff and robust the treads are, you can rely on them to last a long time.